Cuts, scrapes, bruises, muscle aches, dry skin - unfortunately all of these are inevitable parts of living. 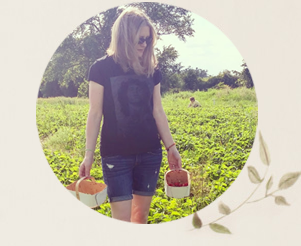 Especially when you are living life to the fullest - which we tend to do in summertime, when the air is warm and the possibilities for outdoor activities broaden. I try to use homeopathic and natural remedies whenever possible. My dedication to these less "conventional" products heightened when we started a family over 13 years ago. 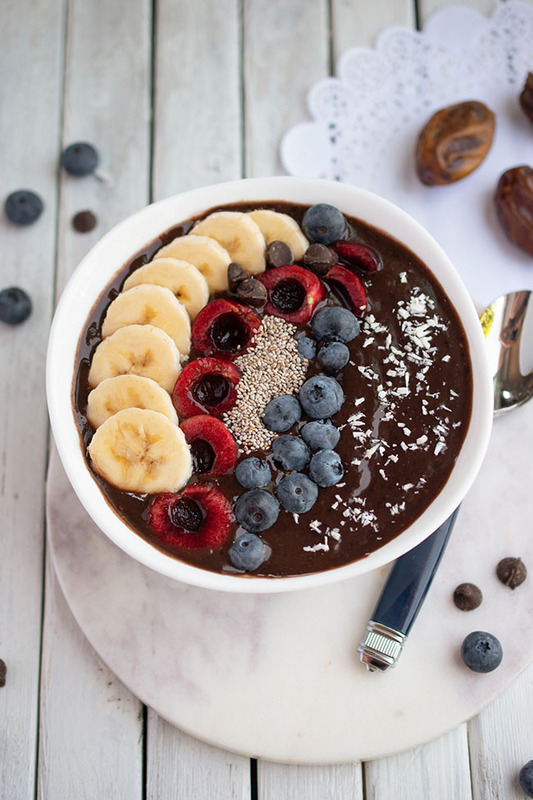 I became very conscious about the need to put less chemicals in our bodies. (And, let's not forget, we absorb chemicals through the creams and cosmetics we put on our skin.) My family "toolkit" has always included Boiron's homeopathic products. They have a number of products that are vegan-friendly, such as Arnicare creams and gels and Cicadermine. Cicadermine is helpful for healing of skin and nasal irritations like red and chapped skin. I have been using it regularly to speed the healing process of a scrape on my daughter's knee (which she got as a result of a fall off of her bike). 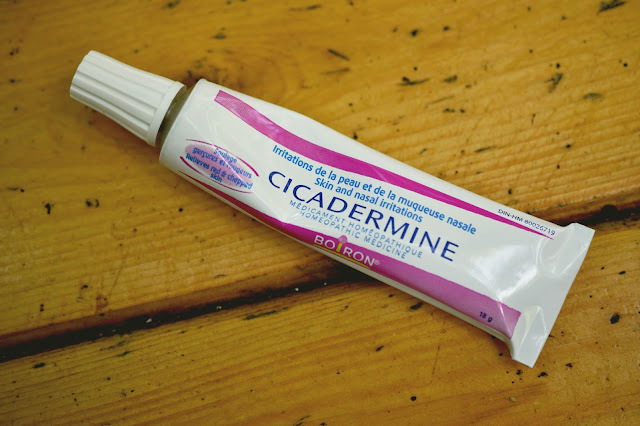 Cicadermine (which also goes by the name Homeoplasmine in other countries) is a great product to keep around not only for summer scrapes but also for winter-ravaged skin. 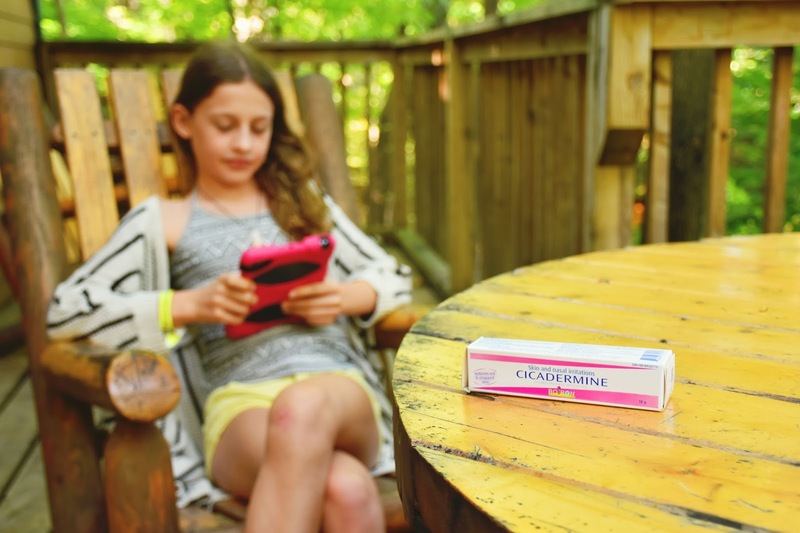 Recommended by Gwyneth Paltrow's Goop.com, Homeoplasmine/Cicadermine can soothe skin irritations and relieve dry patches, chapped lips, sunburns, ailing cuticles and cracked heels (I call them flip flop heels!). It's free of antibiotics and can be applied up to three times per day. My children tend to have "growing pains" like I did when I was a child. In addition they get muscle aches and pains from sports and dance activities. We always check with the doctor if any pain lasts for an extended period or seems out of the ordinary. But for everyday muscle and joint aches and pains, plus bumps and bruises, we use Boiron's Arnicare gel and cream to provide natural relief. 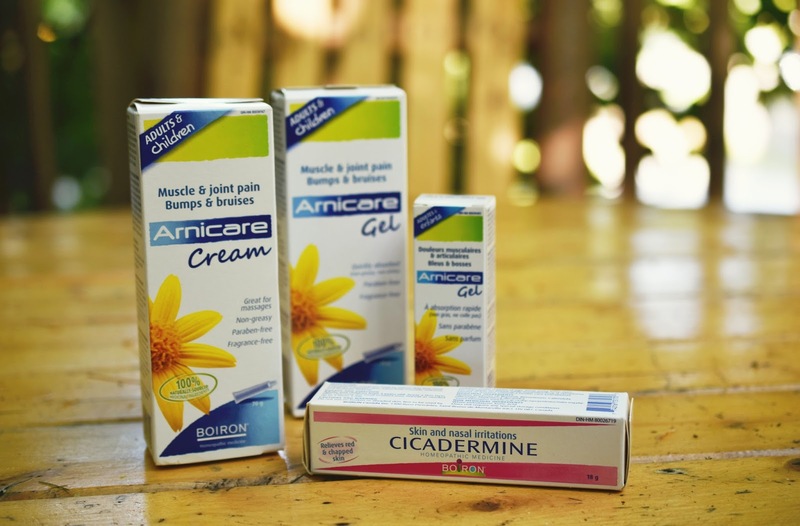 Arnicare helps us to reduce the need for pain relief medications, which can stress our bodies if overused. Most recently I used the Arnicare cream to massage on my daughter's back after one too many cartwheels and attempts at acrobatics left her with a sore back. How I know that it provides relief is that often the pain comes at bedtime - once I've applied the cream or gel she is able to fall asleep. 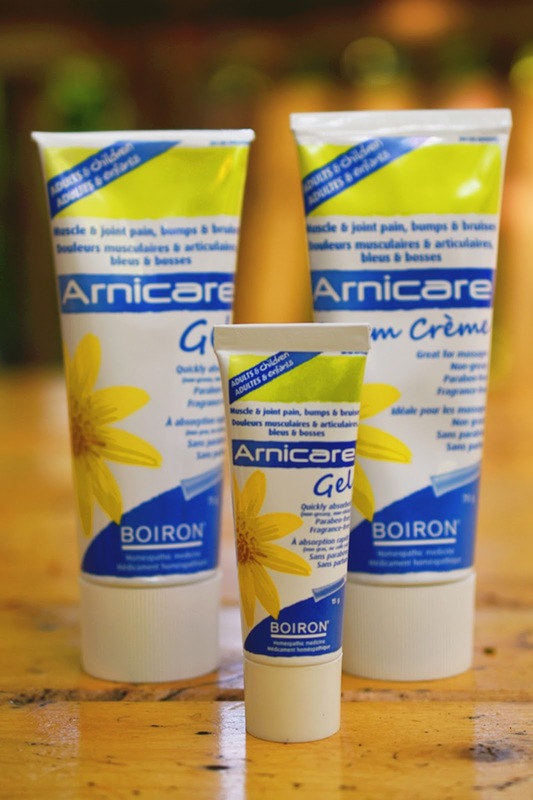 The Arnicare line is made with Arnica Montana - this little flower was discovered in the mountains of Europe in the 16th century and is known to have medicinal properties. Its analgesic properties can help relieve muscle aches and reduce swelling and bruising. Both the Arnicare cream and the gel absorb quickly and provide relief without nasty ingredients that could harm us. They are also not greasy and they're free of fragrance. 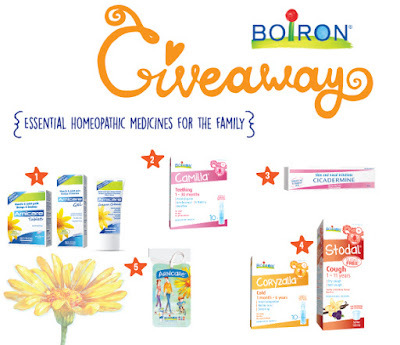 Which Boiron homeopathic medicines would be helpful for you and your family? Canadians, enter to win a package of Boiron products (Worth $100)! Residents of Canada may enter to win using the rafflecopter below until September 23rd. Prize may not be exactly as shown. Children's Stodal Honey would be best for my family. For when the kids get those wintertime coughs! We could really use the Coryzalia® for both of our new grandchildren! Going in to a new crowd or class in a small room after being at home and elsewhere during the summer seems to be a recipe for getting sick fast. So to reduce our chances, Coryzalia Tablets would be my Boiron product pick. The Dapis Gel would be useful. Coryzalia tablets would be great! This stuff is good for pets too. Use arnica on my horses all the time! There are a lot of great products@ Sinusalia would be great for us! Arnica Gel for the win! Arnicare tablets sound like they would be useful for us. Arnicare gel would be great for my family with 5 kids - always bumping & bruising things up! Thanks for the chance to win. Sinusalia would help in the winter. I keep Children's Stodal Honey on hand for when my kids are sick with colds and coughs. We could use the Camilia for teething. Ohh, I think I misspelled my Instagram name. It's really @nicolthe_pickle. Sorry. The arnicare gel would be good. The children's stodal honey. Saved us during last cold season! I think the Camilia would be something we would love to try. Poor baby JJ has been having a horrible time lately due to him teething. I would totally get the Stodal cough syrup to help relieve the kids cough symptoms when this winter season of illness hits. 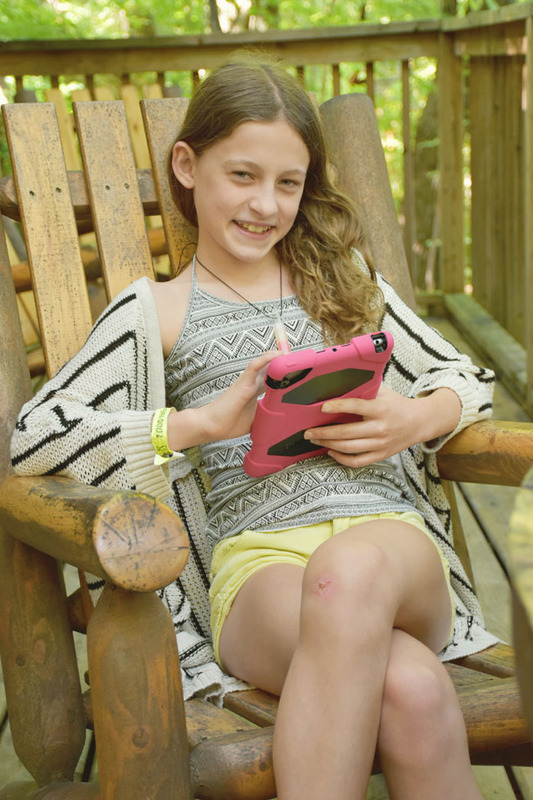 We use the Dapis Gel frequently to help with mosquito bites! Coryzalia tablets would be helpful. The Sinusalia would be great for my family. I'd love to try the Sinusalia! Our family would find Stodal Honey for coughs helpful. It seems inevitable to avoid coughs and colds at school age. The Arnicare gel or cream would be awesome for my family.We are always aching and sore especially if the weather changes suddenly. Coryzalia for cold symptoms certainly would be helpful with fall and winter coming by. The Arnicare gel would be great. The Dapis Gel would be best for our family.